My next two months of local sports viewing will be devoted to college hoops. I'm focusing on visiting new venues and no sport has more than the 351 Division 1 basketball gyms. Not that I'll ever see them all, but there's no harm in trying (my wife disagrees with this statement). Yesterday, despite a cold snap that saw temperatures dip well below freezing, I ventured deep into New Jersey (by deep I mean Hackensack) to witness a battle for first in the Northeast Conference. 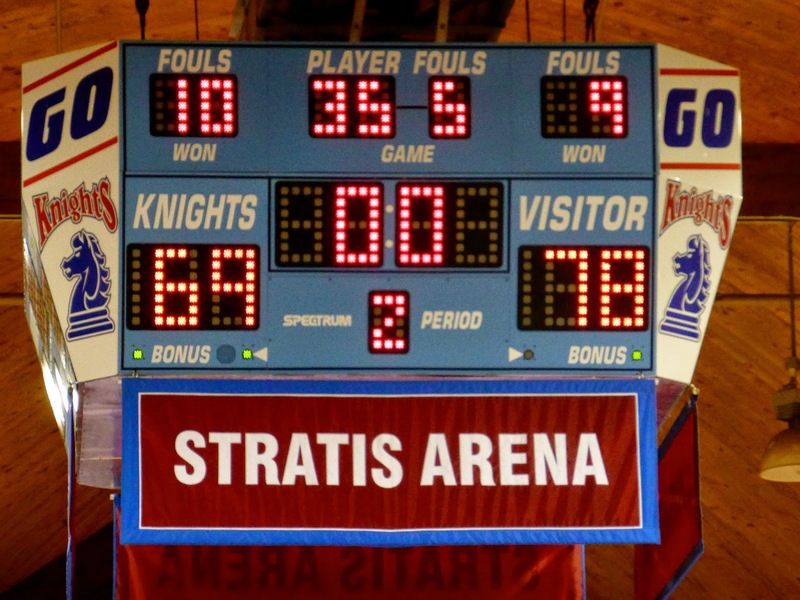 The hosts were the Fairleigh Dickinson Knights, who beat LIU Brooklyn on Monday in a game I attended. 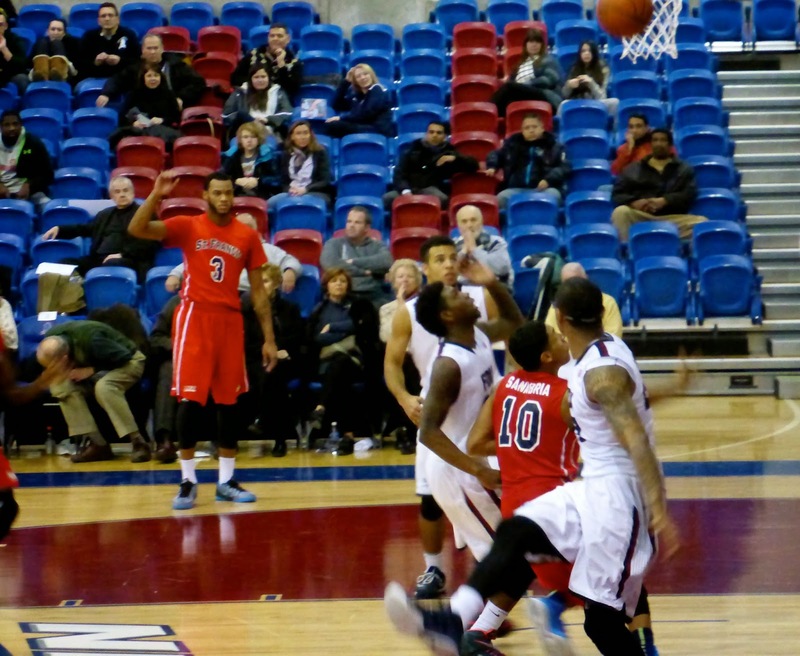 Their guests were the St. Francis Brooklyn Terriers, preseason favourites to win the conference. 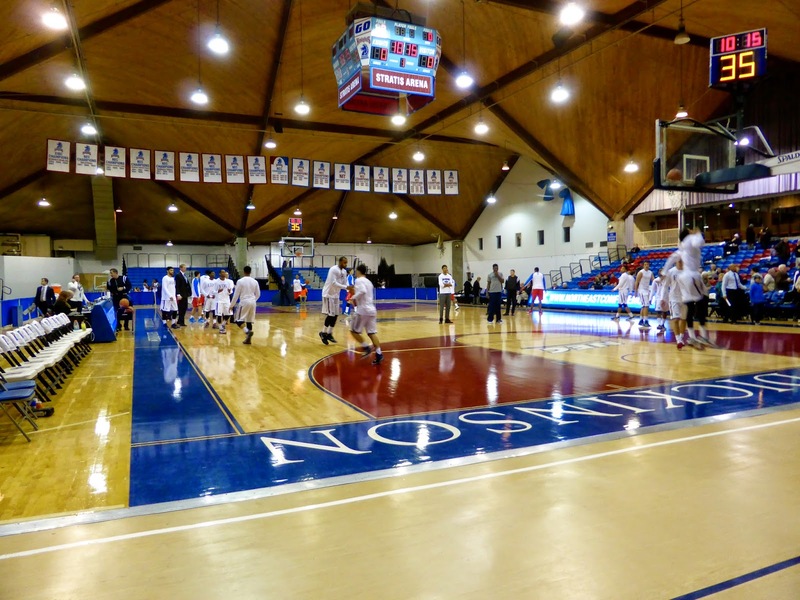 Getting to FDU is not that hard, as the Pascack Valley line commuter train stops at Anderson Street station; from there a 10-minute walk gets you to the Rothman Center, where the Knights play. Getting back home is another matter but more on that later. 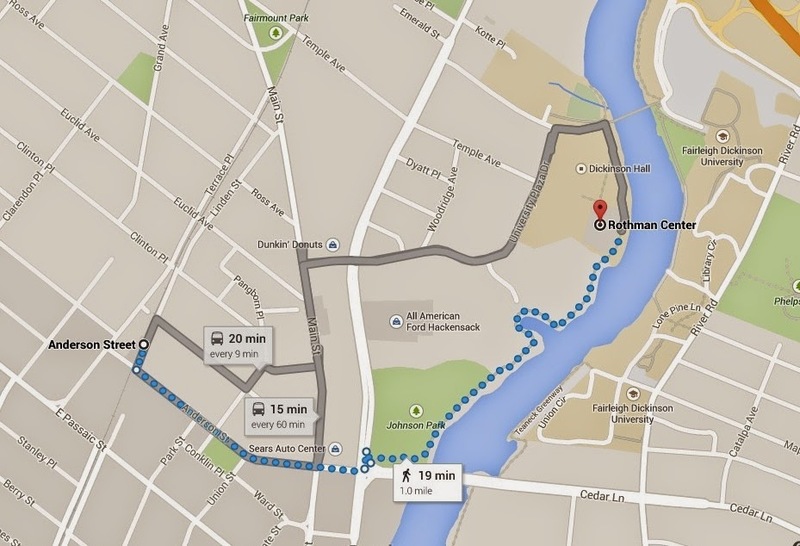 It is important to note that if you are using any sort of GPS system to get there, you need to enter Rothman Center as your destination instead of the university itself, as they are separated by the Hackensack River with the university's main campus residing in Teaneck (you can see the area in the screen shot below). I followed Google Maps and took the roundabout way to the gym, walking along the river in near total darkness. An easier, if less scenic, way to get there is to cut through a bunch of parking lots, but those are not obvious on the map above. General admission tickets are $10 (reserved seats with chair backs are $15) before having to go through security. Yes, even at this level, metal detectors are used. It is worth pointing out that both St. Francis and LIU are in Brooklyn, which by all measures is far more dangerous than Hackensack, and they don't have any security, so I really don't know why they need it here. Anyway, I duly took out all metal objects and entered the gym. 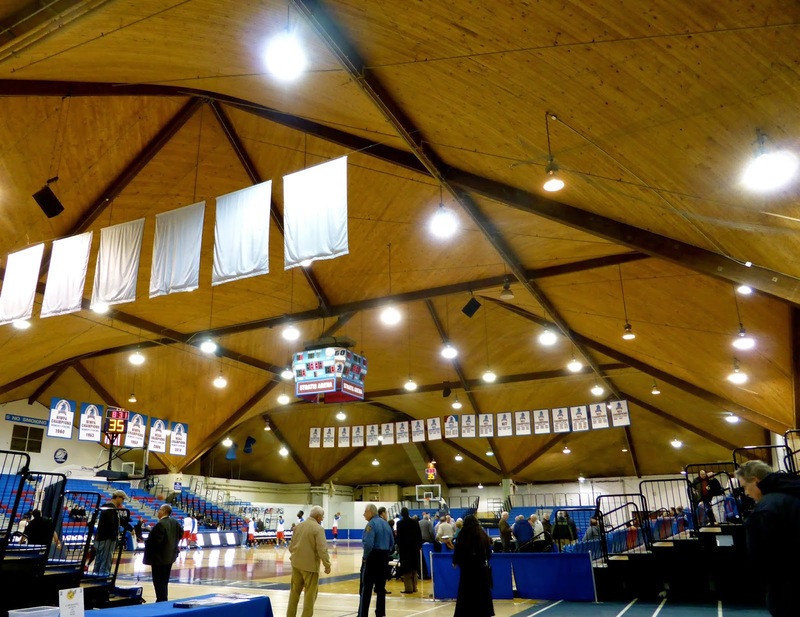 This is another pretty basic NEC facility, with a Hall of Fame which lists a number of former athletes but without any of their achievements (you can see this in the top photo above). 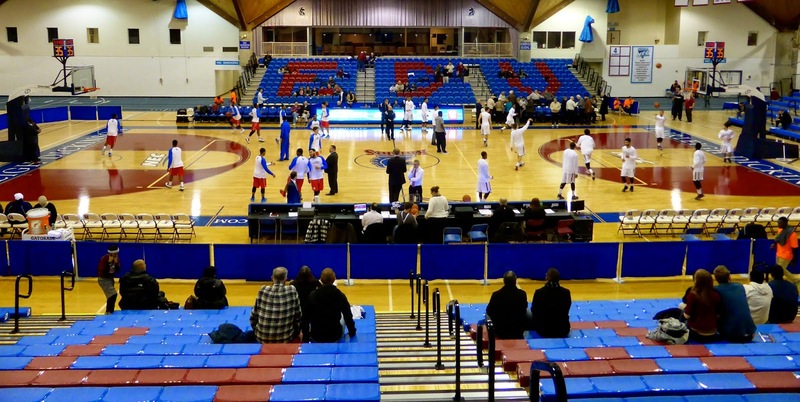 One touch I like is the reserved seats spell FDU in red, while the other side spells Knights. It can't be that hard to order a few chairs of a different colour; all schools should try this to make their gyms just a little more interesting. The roof here is quite different and merits a photo. It doesn't seem to have a special name for this sort of shape; the university's own website calls it "tent-like" suggesting that the university needs to upgrade its English department. My buddy Eddie, who is responsible for getting me interested in these mid-major college games, was already there, so after taking a few pictures for posterity (and this post) I joined him in the top row and we settled in for the game. 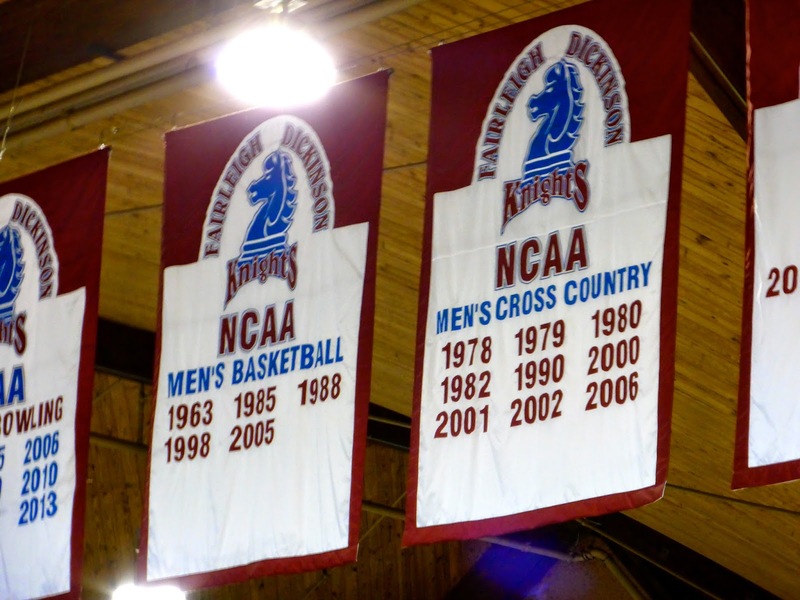 For those who care, FDU's last tournament appearance was in 2005 when they lost to runner-up Illinois in the first round. Both teams came in 2-0 so the winner would have the early lead in the NEC. You might think this meaningless as March Madness berths are decided by conference tournaments rather than the regular season, but in the NEC, higher seeds host tournament games, so this was a somewhat important match early in the conference slate. Moreover, it was the best college game on the schedule as it was the only conference battle where both opponents were perfect having played at least 2 conference games. Yet ESPN did not cover it! And only 682 hardy fans ventured out to see this classic! What is wrong with you people?! (My wife tells me you people are actually normal and I am the one with the problem). Anyway, onto the action. The refs let them play in the first half, with a number of fouls going uncalled (the first was not whistled until after five minutes had passed) as St. Francis built an early lead behind some stellar passing and the shooting of Jalen Cannon (below in red). Down 24-15 after just 9 minutes, FDU began to full-court press and the Terriers were not able to handle it, leading to some quick turnovers allowing the Knights 6 quick points. St. Francis eventually learned how to break the press though, and as we neared halftime though, the Knights started committing more than their share of illegalities, resulting in nine Terrier points from the free throw line as the visitors took a 47-32 lead at the half. The second half saw FDU again use a full-court press to make a comeback, with a couple of long threes from Matt MacDonald helping the team to tie the game at 56 and then again at 58. You've heard about momentum, but studies say that it really doesn't exist and that was certainly the case here as FDU could not take the lead despite overcoming that 15-point halftime deficit. 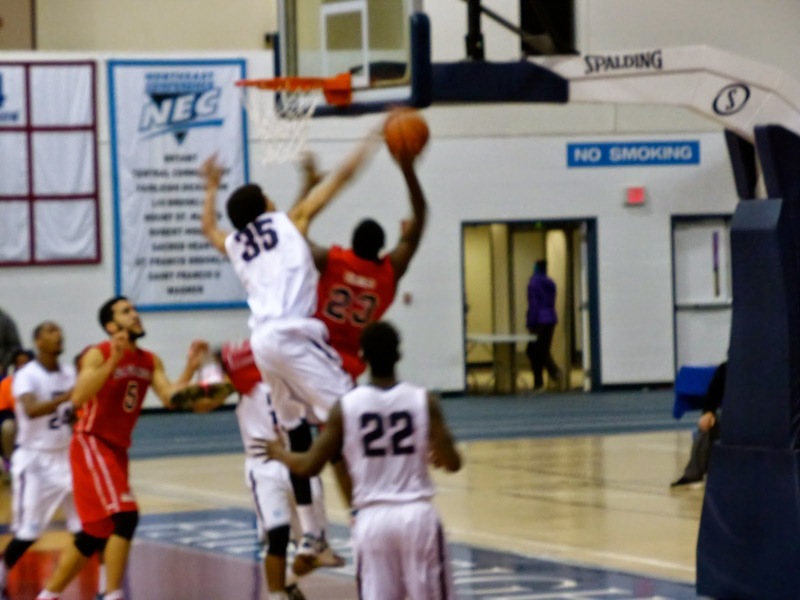 Antonio Jenifer (#3 above) sank a three to stop the run, but FDU hit a couple of free throws to close within 61-60. After St. Francis botched two foul shots, Mustafa Jones missed an easy layup that would have given the home team the lead, and you sensed that it just wasn't their night. Jenifer followed with another three and a layup as the Terriers made it 69-64, and then he hit a third trey with just over two minutes left, and that was essentially the dagger. 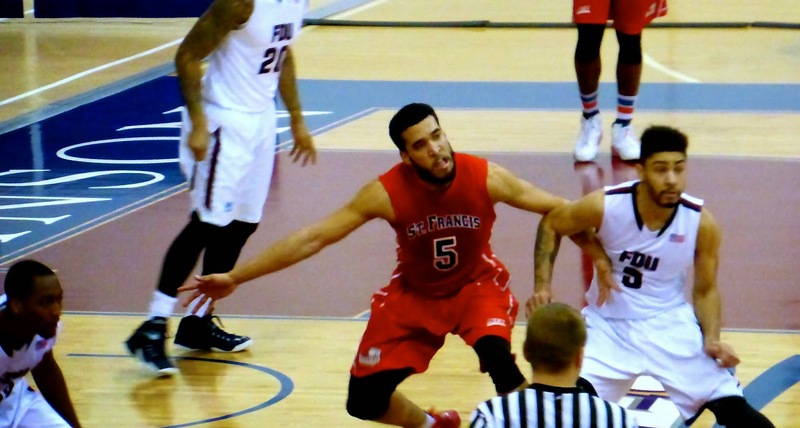 The officials had clamped down in the second half and the last few possessions ended in fouls and free throws as St. Francis won 78-69. The difference was again at the line as FDU was called for 27 of the 42 fouls leading to 39 free throw attempts for the visitors, who only made 26 of them. But that was eight more than the Knights made (out of 21 attempts). As I mentioned, the return to New York is not as simple. Late in the evening, there is only one train back from Anderson Street, that being at 9:54. With the game finishing at 9, that meant nearly an hour wait, but fortunately there are NJ Transit buses that appear every 30 minutes or so that go straight to Port Authority in just under an hour. The bus stops are also quite a bit closer than the train station, so in the end it all worked out. I was surprised to be back home by 10:45, not much later than had I seen an MLB game at Yankee Stadium starting at the same time. This was my 21st NCAA basketball venue, excluding tournament games. So only 330 left to go.